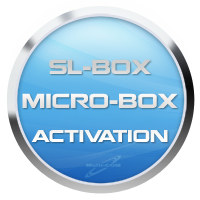 Activation Micro-Box for SL-Box you can activate Micro-Box softwares on Your old SL-Box ! If you got your old SL-Box on shelf and dont use it long time then it's time to back it to work. Ofcourse after update you can use full support access of Micro-Box for 2 years. PLease note that after you make an update you cannot no longer use SL Box software or any updates for it. More about Micro-Box you can read on our page here.